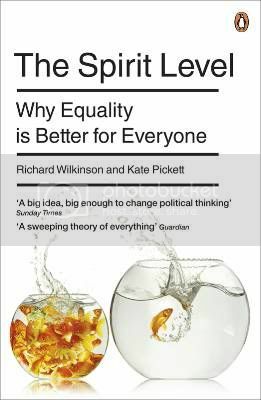 This book written by Richard Wilkinson and Kate Pickett explores the question, “Why greater equality makes societies stronger” – a very interesting idea in the face of the revolts in the Middle East largely based on social and financial inequality. After reading this book, you will be clear that the rich and poor both pay the price. The authors ask why we never talk about equality. We talk about the deficit. We talk about ending the wars in Iraq and Afganistan. We even talk about health care, but never the fact that 4% of the people have more wealth than the other 96%. This is easy. The people talking are among the wealthy. But why don’t we, the 96% with 96% of the vote talk more about it? Why don’t we demand a bigger share? Why are we letting our attention be diverted? They suggest there are two kinds of self-esteem. One where people are happy, able to accept criticism, and make friends. The other one where people are actually insecure but good at self-promotion, insensitive to others and bad at personal relationships. As the social classes move further and further apart, anxiety increases, and people become self-conscious and obsessed with how they appear to others. I have spent a large part of this week thinking that there are more and more people with personality disorders. This book states The United States is second only to Singapore in its inequality. And it’s premise is that inequality causes all manner of problems to society. This being just one. Look around you and see if you are seeing what I am seeing — a lot of posers. Of course, I live in Hollywood, so there’s that. But I can remember a time when this wasn’t the case. Reality shows constantly tell us we’re not living the dream. We’re not enough. And yet if we continue this path of conspicuous consumption, our planet may not make it. We’re running out of resources. And we want to live in a house big enough to park six cars. And most important, there’s no guarantee of jubilation through shopping. The book goes further than mental health into every other area of our lives. As these issues become more and more diverse, we suffer a loss of happiness as a society. And as the mental health example would suggest, the rich suffer, too, because there is always someone richer. So it’s lose, lose. There are two ways to achieve this goal. One uses taxes and benefits to redistribute income. The other is the distribution of information confirming what a lot of people think, but are afraid to say. We would all be happier if we were more equal. The problems diminish as the society we live in becomes more level. We need to make choices that bring us towards the middle and frown on choices that don’t. That SUV you are driving is the result of a lack of trust. And it’s destroying the environment. Do you really need it? When you are buying your third pair of sneakers? Do you need them? How soon will they be landfill? Are the people in power the ones that will vote your conscience? Pay rates at the top could be contained by plugging loopholes in the tax system. And just as a final, almost humorous, thought. Did you know that people below the poverty line, 80% of them, have air conditioning? My girlfriend in Lousianna lives in a trailer with holes in the floor, but just bought a flat screen TV, and she definitely has air conditioning. She made $13,000 last year. Seventy-five percent of those below the poverty level own at least one car, around 33% have a computer, a dishwasher or a second car. Who are they trying to impress? I recommend this book. There’s so much more. Once we understand it, we can fix it. And don’t you love that picture? I agree – this is a wonderful first step. And folks who are coipmalning should consider that, policy-wise, Obama has been the most LGBT-friendly American president ever. Sure, I’d love to hear a full-throated endorsement of SSM from him based upon legal equality and precedent – after all, he’s a constitutional lawyer. But let’s face it, Obama already has a reputation as an intellectual egg-head that some folks just don’t appreciate. So bringing it down to the level of the personal is a disarming way to open the dialog. I’m impressed and heartened. I hope that it helps to defeat the MN amendment in November.